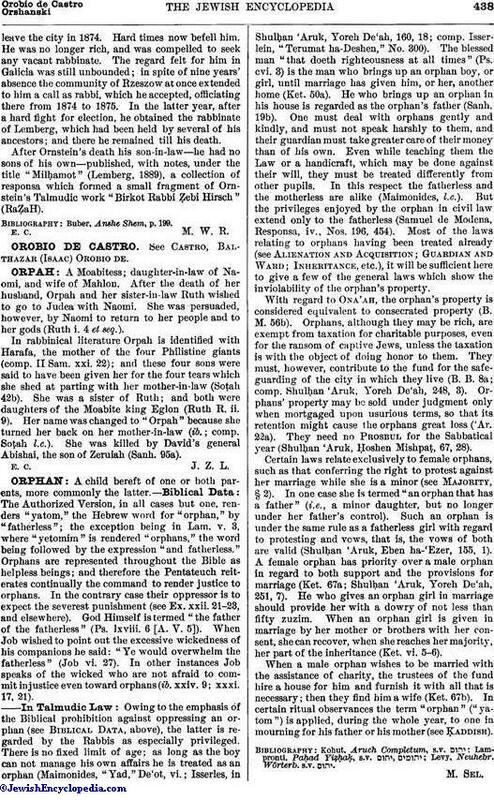 A Moabitess; daughter-in-law of Naomi, and wife of Mahlon. After the death of her husband, Orpah and her sister-in-law Ruth wished to go to Judea with Naomi. She was persuaded, however, by Naomi to return to her people and to her gods (Ruth i. 4 et seq.). In rabbinical literature Orpah is identified with Harafa, the mother of the four Philistine giants (comp. II Sam. xxi. 22); and these four sons were said to have been given her for the four tears which she shed at parting with her mother-in-law (Soṭah 42b). She was a sister of Ruth; and both were daughters of the Moabite king Eglon (Ruth R. ii. 9). Her name was changed to "Orpah" because she turned her back on her mother-in-law (ib. ; comp. Soṭah l.c.). She was killed by David's general Abishai, the son of Zeruiah (Sanh. 95a).